Fleeceworks 1/2 pads are constructed from the best hand picked Australian Merino Fleeces. This premium half pad is designed with an elastic strip that gives laterally away from the spine to put extra give into the pad eliminate the chance of any pinching along the topline and spine. Maximum comfort and heat dissipation lets horse perform to it’s best, recover sooner after strenuous activities. Look after your athlete, let him perform to their best, buy the best quality Half pad – buy Fleeceworks, they have you covered! Made from high quality, medically-tanned Australian merino sheepskin. The wide, clear spine keeps your saddle channel clear and features elegant Kieffer logo detailing. 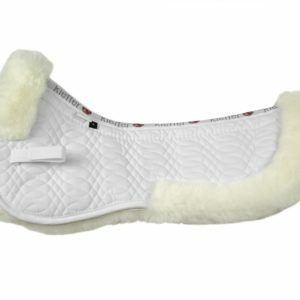 The ANKY Saddlepad Dressage features the very latest in innovative materials. The exterior is a tactile suede while the interior is Coolmax and assures optimal moisture management. The thick technical filling ensures that the pad will remain perfectly in place. Top Quality Sheepskin with Top Performance Ultra ThinLine, this is a top seller. High wither profile creates the most comfortable fit. Your Ultra ThinLine is always in the right place. The Ultra ThinLine Half Pad is the basic ThinLine saddle pad that covers only the weight bearing surface of the saddle, and is designed to be very minimal and discreet. You will see increased performance in how your horse lifts its back and all riders will sit quieter and be able to do more with lighter aids! 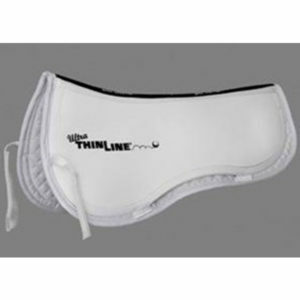 The ThinLine Half Pad measures 17.25″ across the shoulder, 21″ long, and 13.75″ in the seat, and usually fits most English saddles up to 17″. If the panels on your saddle are larger than these dimensions, if you have left-right slippage problems, or jump large fences, look at the Ultra ThinLine Contour pads. Improves Rider Equitation through Maximum Rider and Saddle stability. Spine free, wither profile creates the most comfortable fit. Modify saddle fit–without having to buy another saddle! Sizing: The Trifecta Pad is available in the following sizes: Small, Med, and Large. To choose the best fit for your saddle, measure your panels and compare them to the dimensions below. Choose the saddle pad that is large enough to cover the dimensions of your saddle’s panels to ensure proper fit for your horse. Small: The cotton pad measures 20″ along the spine and 14.5″ across the widest point of the seat. The Ultra ThinLine panels measure 19.25″ long and 13.5″ across the seat. Medium: The cotton pad measures 22″ along the spine and 16″ across the widest point of the seat. The Ultra ThinLine panels measure 21.75″ and 15″ across the seat. Large: The cotton pad measures 23″ along the spine and 16.5″ across the widest point of the seat. The Ultra ThinLine panels measure 22.75″ long and 15.25″ across the seat. Ultra ThinLine Trifecta Half Pad with Sheepskin Rolls takes the basic Ultra ThinLine Half Pad to a whole new level. 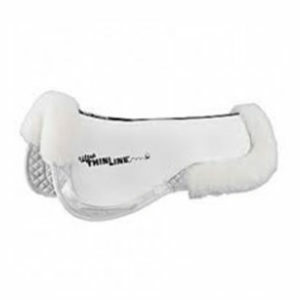 ThinLine developed this pad to give riders the fashion appeal of fleece worked around the edge and the shock absorption they and their horses need without the bulk, high maintenance or cost of a full sheepskin pad. The Trifecta offers no interference for riders who prefer close leg contact with their horse. The Trifecta fits under custom and off the rack saddles, and because of the pad’s sleek design, it aids saddle fit. Like the entire ThinLine collection, the Trifecta molds to the horse’s body as the horse warms up, creating the customized ThinLine no slip shock absorbing fit and feel. Available in two sizes: Medium: measures 18″ between the rolls and 23″ including the rolls. Large: measures 19 1/4″ between the rolls and 24″ including the rolls. Longer and wider in the flaps than the Ultra ThinLine half pad, Contour pads fit a wider variety of saddle shapes and sizes. The regular contour pad measures 25″ across, 21″ long and 13.75″ seat. Fits most saddles up to 17.5″ Large size fits most 18″ + saddles, measure 27″ across, 23″ long and 15″ seat.